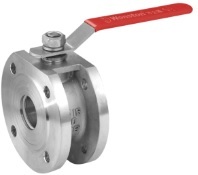 A stainless steel conventional wafer ball valve, class 150(150LB). Design features: Anti-Static devices for ball-stem-body; blow-out proof stem; pressure balance hole in ball slot; handle lever operated without locking device; full port(FB), RF flanged ends, conventional type, 150LB. Design standards: design code: ASME B16.34; fire safe: API 607, ISO 10497, API 6FA; end flange: ASME B16.5; inspection & testing: API 598. The G.A drawing illustration of stainless steel conventional type wafer ball valve, lever operated, 150LB. 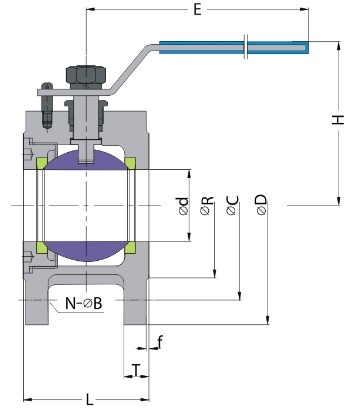 Dimensions of stainless steel conventional type wafer ball valve, Class 150. All dimensions are in mm unit.